What do Grilled Basil, Spinach & Honey Pizza, Beef & Mushroom Sliders, Skinny Caesar Salad With Grilled Romaine, and Grilled Chicken & Pepper Party Sandwiches have in common? 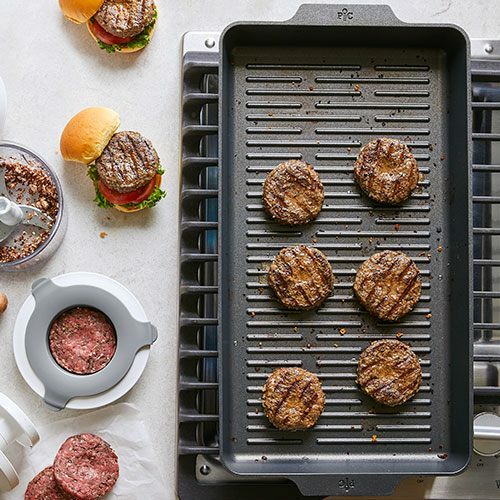 Simple they are just four of a wide variety of recipes you can make on our Nonstick Double Burner Grill Pan. As you may have noticed you now have links to all those recipes in case I have made you hungry. I had two options this week. I could talk to you about some of our nylon cookware or our nonstick double grill or griddle, so I went with my favorite, the Nonstick Double Grill Pan. As many of you know I have a hectic life balancing three jobs, time with Zoe, time with the Ultimate and time for me. I need cookware that I can trust and is going to make meal prep easier for me. That is in part what this piece of cookware does. I have spent less time cleaning this cookware than I did cooking in it. In part it is because of the 4 layer surface treatment which allows food to wipe off and unlike other nonstick cookware, this is also dishwasher safe. Another thing I love is that I do not have to be intentional about grabbing the nylon utensils as the construction of these pans allows me to use metal utensils and not worry about scratching them. The other thing I appreciate is that the flat bottom allows for even and consistent cooking. Of course, I love the lifetime guarantee, although I doubt I will ever be using it. The more I think about it, the more I realize that what I love about this pan is that it reminds me of my relationship with the Ultimate. It is consistent, sturdy, nonstick and comes with a lifetime guarantee. No matter what I am going through in my life, even if my faith is shaken, our relationship is not. Even if I am not paying attention to my journey and overcook something in my life, the Ultimate just wipes it off, helps me learn and stays with me through the situations I love and those I wish I did not have to go through. The love the ultimate has for me is like this grill pan. Regardless of what is going on in my life I can always grill. Good weather or not, I can grill inside even if I cannot grill outdoors. I no longer have to use multiple pans to cook a meal if I do not want to, I can cook both parts of my meal in one pan at one time. I can cook ahead for the week in this pan or I can cook enough to feed ourselves and company. Nothing keeps me from being able to create a meal and serve others. If you need to add this to your kitchen visit http://pamperedchef.biz/sharonjacobson or if you would like to get it at half price by hosting a FB party with me, just let me know.